Ladies, we like to talk, right? I mean, it’s said that women speak 3 times more than men. This has turned out to be a myth, but the point is it appears that women talk all the time, whereas men tend to be more reserved. Or so the myth says. I had a great grandfather who barely spoke. He would sit at the dinner table and simply stare at the thing he wanted until someone noticed and gave it to him. My great grandmother was so intune to what he needed that she didn’t even have to ask. It took her a split second to figure it out. She, on the other hand, talked all the time. I think she talked enough for the both of them. As a wife we get to see the life of our husband in a way that no one else does. We hold great power in showing love, encouragement and praying very specifically for our husbands. Things that will not only build up our husbands but also strengthen our marriages and build up our homes. On the other hand we also hold great power for destruction. Our words and tone can destroy fellowship and motivation, and our criticism takes away peace and creates resentment. Because we are close to our husbands it is easy to share our thoughts without discerning first if these words will build up or tear down. God has given us two ears, but one tongue, to show that we should be swift to hear, but slow to speak. God has set a double fence before the tongue, the teeth and the lips, to teach us to be wary that we offend not with our tongue. 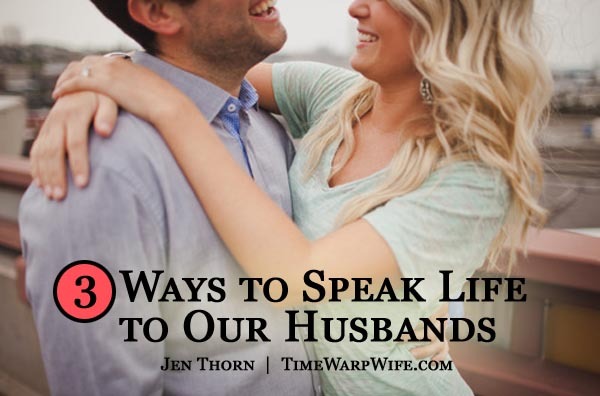 Here are 3 ways to speak into the life to our husbands. The words of God are powerful. They are life-giving, filled with encouragement and wisdom. They can turn a bad day into a good day. The words of scripture can alleviate anxiety and calm a restless spirit. What should you share with him? Do you need a Verse a Day For Your Husband Calendar? No. You can share what you are learning from scripture. Tell him what you are reading about and what God is teaching you. Or even what God brings to your mind as you are living together and facing both blessings and obstacles. How can you encourage your husband? Is he having a bad day? Is there a lot of stress at work? What words does he need to hear to make his day better, more joyful, more Christ-centered.? Let him know that you are praying for him. When he does well, tell him so! Your words can prove to be more powerful than any others in his life. Her opportunity is one which the loftiest angel might covet. Not the happiness only of a manly life—but its whole future of character, of influence, of growth, rests with her. Addressing something that needs to be corrected in one another is not only something that should be a part of the lives of brothers and sisters in Christ, but needs to be part of marriage. All too often unhelpful criticism, or passive aggressive comments, reign in our marriages. We must speak truth to our spouses, but only with grace and love. Affection does not forbid, but actually demands that we point out one another’s faults. Yet, this should be done in all the meekness of wisdom, united with all the tenderness of love. Ladies, we know our husbands better than anyone else, and no one else is suited to speak into his life in the way we are. Do not waste your words, nor misuse them. “Let your speech always be gracious, seasoned with salt, so that you may know how you ought to answer each person.” (Colossians 4:6). This is especially true for the building up of our marriages. thank you for your godly wisdom. so helpful to me each day! My husband recently talked about 1 Cor 13 when “love rejoices in the truth” – that’s like your third point, when we hear truth (even when it’s – ouch – corrective! ), we rejoice because we’re growing. Thanks for the post Jen! “We know our husbands better than anyone else, and no one else is suited to speak into his life in the way we are.” Boy! This is so true. What a great reminder that no one is better suited than his wife (me!) to speak into his life. Thanks, Jen!